Down here in the southern hemisphere Halloween is a bit hit and miss. Some people get into it, others don't even realise it has come and gone. Each neighbourhood has it's own unspoken Halloween rules – where we live we have to hang something Halloweeny on our front fence to let kids know it is ok to trick or treat. 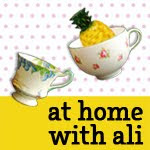 My big plan was to hang some black and orange balloons but frankly after looking at so many fabulous Halloween craft ideas from the blogosphere balloons seem a tad lame. (If you are interested, here are the links to a couple of my favourite Halloween ideas – pumpkin drip paintings from the Imagination Tree, Incy Wincy spider from NurtureStore and screaming banana ghosts from Creative with kids). Cakey and I decided to make some spiders to hang out the front of our house. Not having much energy this week thanks to the 15 month old who won't sleep I decided to keep it simple. 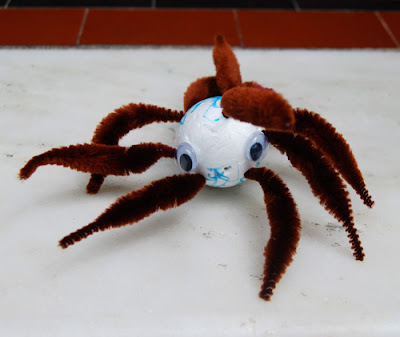 We had some styrofoam balls on hand which Cakey turned into spiders by poking in pipecleaners for legs and gluing on some googly eyes....and that's pretty much it. At one stage I was trying to get Cakey to put in eight legs so her spiders were anatomically correct. I soon gave up – some have more than eight, some have less – she loves them all equally. I love that those are super simple. Having two little ones at home, I need super simple. 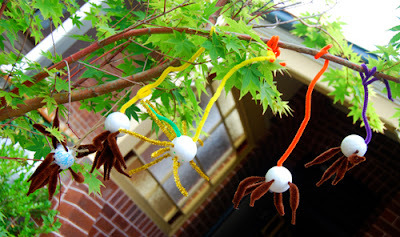 I have some easy spider themed activities that I linked up to the Sunday showcase too.